You are stuck on an island and have been tasked by the natives with dividing a plate of chocolate into 4 equal pieces, one for each of the island's gods. Each god must have an equal share, or you go into the volcano. The plate is a perfect square. The only tools you have are a short knife, a perfect circle with diameter equal to the side of the plate, and a Y shaped thingy with angles of 120° and leg lengths equal to the radius of the circle. 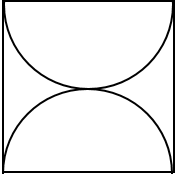 You are skilled enough to line up two objects perfectly, and to cut along a marked line perfectly, (but are unable to cut perfectly just eye-balling it). How do you satisfy the island's gods? 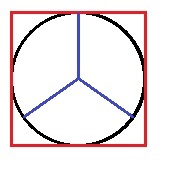 Place the circle so that its edge touches two of the square vertices. Align your "Y shaped thingy" so that one vertex touches the side of the square and the others touch the edges of the circle. Use the leg of the thingy that lays out of the circle to mark a line on the square with your knife. 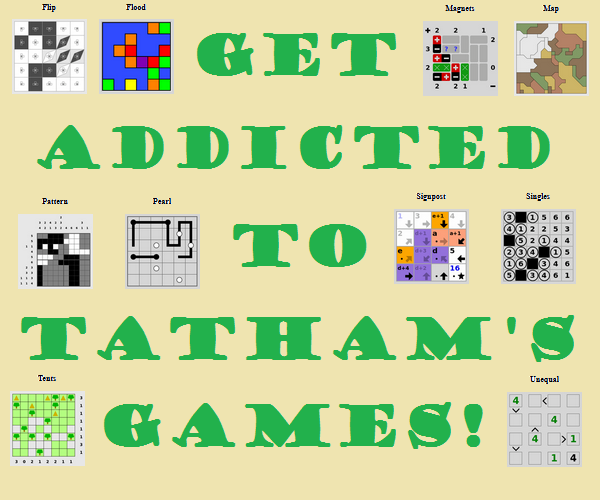 Rotate the square and repeat three more times. Cut the square using the marks you made. 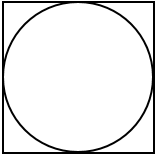 Lay the circle directly on top of the square, and cut along the outside of the circle. This method divides the square plate of chocolate into four equal pieces, as shown in the diagram below. 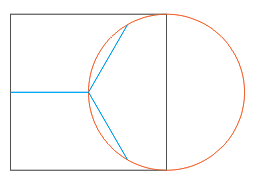 Move the circle from its current side-alignment to align with an adjacent side of the square. 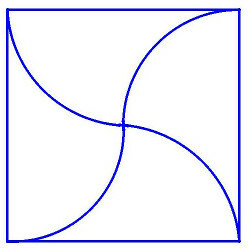 Cut a quarter arc counterclockwise from a corner of the square, stopping each cut upon meeting the initial arc or a previous cut. Use the Y-shaped piece to find the midway point of any side (this will be where all three prongs join), rotate it until one prong touches both circles (center of square). Cut along this line. Note that the arc in the middle didn't actually cut through the chocolate; it's just a mark. 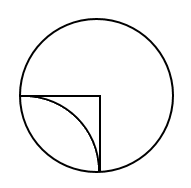 Align the circle so that it is tangent to each side of the square. Align the Y thing between the chocolate and circle so that it touches the circle at each tip, as shown. The radius of a circle that touches a point of tangency is perpendicular to that tangent, so the vertical piece of the Y thing marks the position of half of the vertical center line of the chocolate. 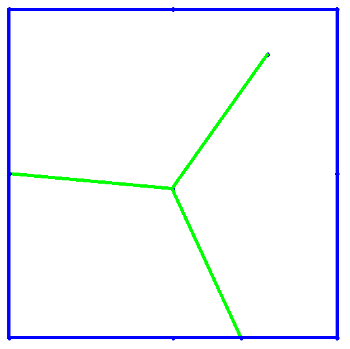 Rotate it 180° to finish the first bisector, then complete the horizontal division line in a similar way. This will produce 4 equal size squares of chocolate. In my previous answer, I used only the circle to divide the square plate of chocolate into four equal pieces. In this answer, I show how to divide it equally using only the Y shaped thingy. 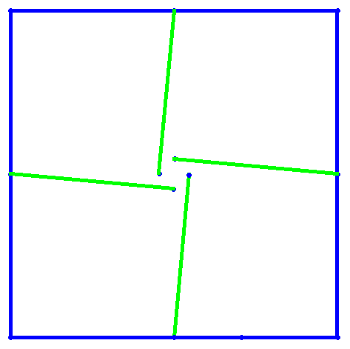 The general idea is to use thingy to make four long cuts toward the center, each identical relative to its side of the square; and then make two slices across the short gaps to complete the cutting. On each side of the square, place thingy with one post-end in a corner, and the Y-junction clockwise (of that corner) on the side. [See first diagram.] At each placement, mark the Y-junction location (ie, the midpoint of the side). 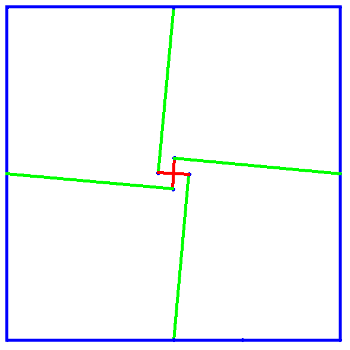 Make two short cuts across the plate-center to connect the ends of opposite long cuts, as shown in red in the fourth diagram, using any leg of thingy as a straightedge. 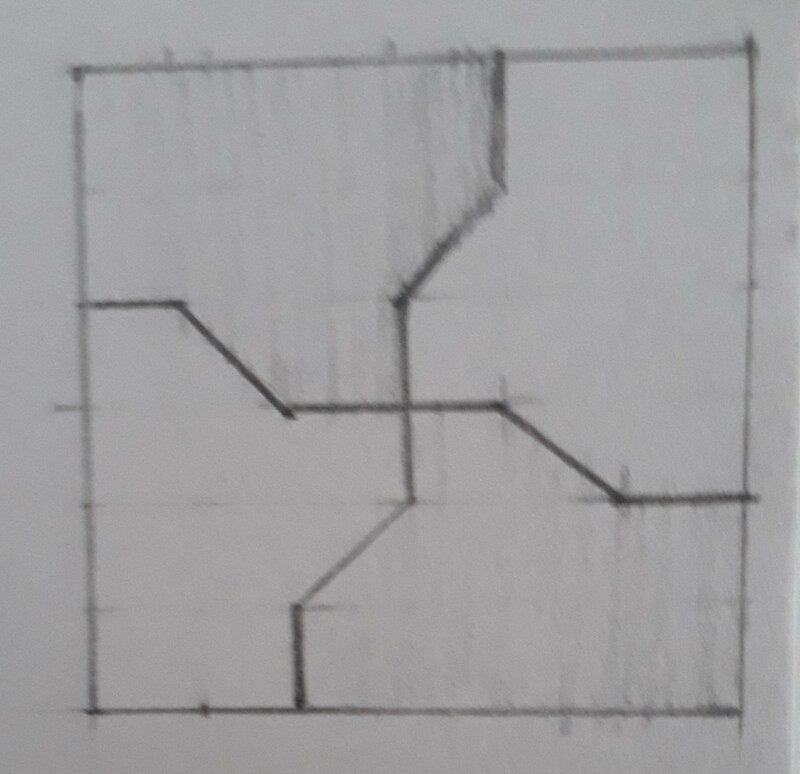 Edit: A slight variation of this method allows cutting the large square into four equal small squares (instead of shapes with six edges each) using only the 3-leg thingy. 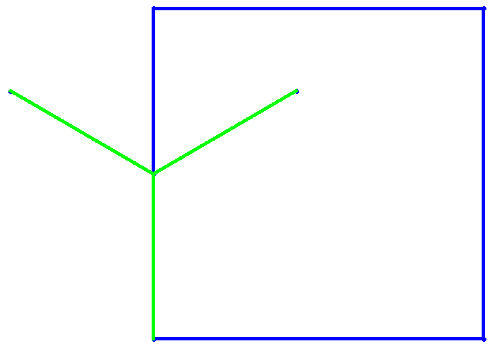 Rather than making the long cuts shown in green in the fourth diagram, just mark their endpoints near the center,and make the red lines as marks also. Their intersection marks the center of the plate. Now use a thingy leg as a straightedge to cut from each side's midpoint to the center. Cut the circle in half using the plate as a guide. Perfectly align the two pieces edge to edge and use them as a straight edge to cut the cake diagonally, twice. Help! I lost my marble(s)!